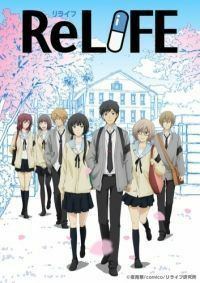 If you want to watch ReLIFE in anime form, the story has now been completed, as of July-September 2016 (eps.1-13) and March 2018 (eps.14-17). I love it all, but be warned. This isn't Season 2. It's not standalone enough for that. There's a certain amount of catch-up in ep.14, but they don't re-introduce every single cast member. You could probably watch just these four episodes if you really wanted to, but I wouldn't recommend it. Start from the beginning. Rewatch the 2016 episodes first. (It's a good show. You won't regret it.) I only watched the TV series last month and I was occasionally having to remind myself who's who, whereas most viewers will have had an eighteen-month-gap. Let's recap the story. ReLIFE is an organisation that sends you back to high school, giving you drugs to make your body look ten years younger. (This is supposedly an "experiment". You could go down some dark paths if you started speculating about who or what was behind these experiments, but they appear well-intentioned.) Our protagonist is Arata Kaizaki (real age 27, apparent age 17) and he's approaching the end of this second chance at high school. Soon he'll graduate. His friends will go on to university or whatever else they've got planned, but Kaizaki will return to his old adult life, albeit hopefully with a new perspective on things. Oh, and he'll be erased from all of their memories. No one's allowed to remember a ReLIFE candidate after the year's up. I'm not entirely sure why, to be honest, and there's one particular way in which it seems counterintuitive. However those are the rules. That's what underpins the emotions of these four episodes. I can't really go into detail, because even basic information about eps.14-17 is liable to be a spoiler for eps.1-13. I don't want to spoil those. Suffice to say, though, that the show's still both sincere and funny. It's not a downer. Hishiro's journey is very interesting. Onoya still makes me laugh. Kariu still seems like hard work. Yoake isn't punchable any more, but that's character growth for you (and his improved relationship with Kaizaki). The show's still great. These four episodes are a romance, or perhaps a romantic comedy. Just make sure you don't miss the bit after the final end credits.